In today’s fast-changing world, transformation is vital to future GROWTH. You need to surf waves of OPPORTUNITY. You need to be on a constant QUEST to wrestle new efficiencies from existing assets. You need to run at the right SPEED, in the right direction. REINVENTION’s 90 day business and brand reinvention processes will put your company on the path to continuous transformation. 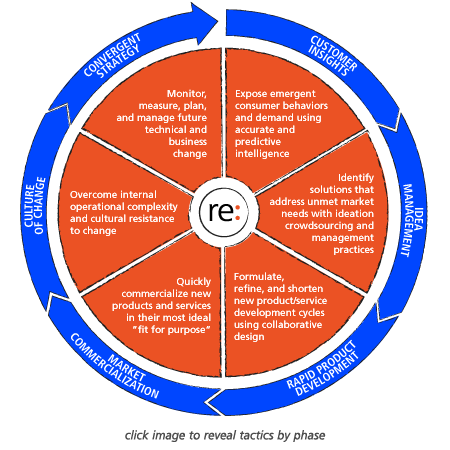 Learn more about our 90 day business reinvention process. Learn more about our 90 day brand reinvention process. Give us 90 days. We’ll help you ACCELERATE core and new-growth innovation, increase your ability to ADAPT to marketplace fluctuations, BOOST productivity, and IMPROVE ROI. You’ll create a new innovation-ready CULTURE and ENGAGE both customers and employees like never before. 44% of companies whose innovation strategies are clearly aligned with their business goals delivered 33% higher enterprise value growth. Source: Booz & Co.